The Spooky Series by S.E. 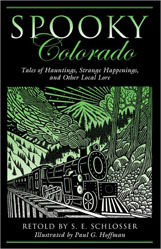 Schlosser: Ghost stories, strange happenings, and paranormal folklore published by Globe Pequot Press. "If you have ever felt a chill as you walked past a Vermont graveyard, or felt an unseen hand brush against you on a mountain in Maine, you will love Spooky New England. And if you don't believe in ghosts--you will." "Spooky New England is one of those books that you cannot put down until you reach the end...This is the ideal book for curling on the couch on a rainy afternoon and enjoying an entertaining read." "The author lets the stories speak for themselves which is virtue not possessed by many folklore books... "
"If preparations for Halloween have put you in an eerie frame of mind, S.E. 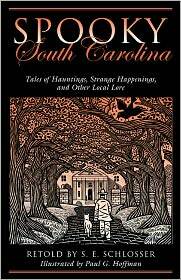 Schlosser has the perfect book for you..."
"If you've not yet seen North Country specters slinking about cemeteries and creaky old homes, now you can � "
"The great thing about this book is that, like most folklore, it seems like you've read or heard most of the stories before. They exist in the periphery of our memory, and reading them again is like coming home to hear familiar stories from a favorite grandmother..."
"...Every page in this book (Spooky Virginia) was a welcome return to the kind of ghost story I like best--haunting tales of things gone wrong, cruelty repaid, and horrors revisited again and again." "S.E. 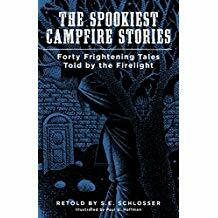 Schlosser is a well-known author of "Spooky" books, and (Spooky Campfire Tales) is one of her best! The stories are excellent for any Cub Scout outing, being quite scary and relatively short... These stories are great, really hitting the target with listeners of any age." - Kurt A. Johnson, Amazon Hall of Fame Review, Vine Voice. "...Ghosts, ghouls, pirates and the devil abound in the legends of Maryland. Schlosser's ability to invent and craft an engaging short story around a fantastic legend, no matter how implausible, is a refreshing way of looking at legend and lore. Lovers of both history and a well-told tale will enjoy this interesting collection...If you enjoy a tale born solely of legend and lore and crafted by a master raconteur, you'll find it here." - D.M. Rosenthal, Ridge Writers News Review Columnist. Nothing goes better with gooey s'mores and a glowing campfire than a ghost story. Vampires, werewolves, witches, Bloody Mary, the Wendigo, and other frightening specters populate the pages of this compelling collection of S.E. 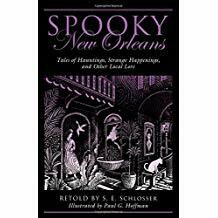 Schlosser’s best ghost stories and her favorite horror classics from Edgar Allen Poe, Charles Dickens and more. From a mad logger to the headless horseman of Sleepy Hollow, these tales will send shivers up the spines of every camper. "It comes," Summer Moon intoned. "It comes with the storm!" Only the chief dared face the frenzied wise woman. "What comes, good mother?" he asked. She turned her glowing eyes upon him. "Wendigo." 'Take it down!' the captain roared. "Take it down and bury it!" He staggered away from the head on the pike, which reappeared before him. The woman's dead eyes gazed defiantly into his own, her long gray hair blowing wildly in the wind. I called to Jimmy, who was just a yard in front of me, but he couldn't see the spirit floating toward us across the marsh. Puffs of freezing air formed in front of my nostrils as the little girl started to sing: "I know moonrise, I know star-rise, Lay dis body down." "Father...." a voice hissed softly a few paces to his right. Old Man Whales screamed and whirled around. Blood Mary stood smiling at him through her blood-stained, razor-sharp teeth. The Devil said: "I can make you the richest man in the province if you sell your soul to me," he drew a thick parchment from his pocket. "On the first day of each month after the agreement is signed, I will fill your boots with gold." "North Plainfield Fire Department," I said into the phone, expecting to hear the dispatcher calling us to a fire. Instead, a frantic woman's voice rang over the connection: "We need you to come at once. There is a terrible ghost in our house and we want you to remove it!" "Pull up a chair or gather round the campfire and get ready for creepy tales of ghostly hauntings, eerie happenings, and other strange occurrences under the New Orleans skies. Whether read around the campfire on a dark and stormy night or from the backseat of the family van on the way to grandma's, this is a collection to treasure. " Suddenly, his eye was caught by a light rising from the ground in the cemetery. His heart pounded in fear as before his startled eyes, a white mist burst forth from an unmarked grave and formed into a large horse carrying a headless rider. 'My riiiiiinnngg! I want my ring!' the ghost of Kate wailed. The pressure on Mary's ears was something awful. She clapped both hands over her ears and shouted: 'I ain't got it!' 'Yes You DO!' roared the ghost. I was awakened by soft strains of music that seemed to come from everywhere at once. As I listened, the haunting melody faded away. And then I heard my wife screaming. A thumping noise awoke him. It sounded like an animal was climbing up the side of the cabin. He heard a scratch, scratch, scratching noise, like the claws of a cat. And then a voice rang out: "Tailypo, Tailypo; all I want's my Tailypo." S. E. Schlosser has been telling stories since she was a child, when games of "let's pretend" quickly built themselves into full-length stories. A graduate of the Institute of Children's Literature and Rutgers University, she also created and maintains the Web site AmericanFolklore.net, where she shares a wealth of stories from all fifty states.